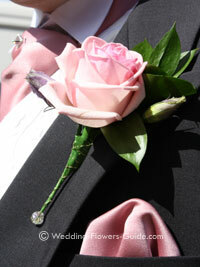 Having good quality wedding boutonnieres can really make a difference to how the male members of the wedding party look. It is the finishing touch that that can provide a sense of style. Although it is only a small flower, there are many elegant ways to give your wedding boutonnieres a chic look. Little embellishments such as the creative use of foliage, wire and beads can make a huge difference. People do notice these original design features. Whenever we have exhibited at wedding fairs, our buttonholes have always been raved about. This is simply because we have used a little creativity in their design. The colour of your wedding boutonnieres can be chosen to either contrast or complement the colour of the groom's outfit. For instance a black morning suit with a burgundy cravat could be complemented by a burgundy boutonniere made from a tulip, calla lily or rose, like the one seen in the photo above. Alternatively, you could arrange for buttonholes to be made that mirror the flowers in the bride's bouquet. Like the two seen in the photos below, I made these to coordinate with the bridal bouquets. It looks really nice in the wedding photos if the flowers are the same. For guys who 'don't like flowers' you can tone things down by using smaller blooms or substituting them with thistle, or foliage or even herbs such as rosemary. The boutonniere should be worn on the outside of the buttonhole of the left lapel, and not in it. Here is a quick video I made to show you how to attach your wedding buttonhole. It is common to secure it in place by using a pearl-headed pin from the back of the lapel. The pin will then be invisible from the front. If you have a gold or decorative pin you may want to show it off and then you could pin the boutonniere from the front. Is it Wedding Buttonholes or Wedding Boutonnieres? Wedding boutonnieres is the common term used in the US for a gentleman's flower or flowers worn on the lapel. In the UK the term wedding buttonholes is more common. UK florists regard a buttonhole as being based around a single dominant flower, whereas a boutonniere is a group of small flowers such as stephanotis. On this website we use the terms interchangeably. Weddings are generally focused on how special the bride looks. Wedding boutonnieres are an inexpensive way to ensure that the groom looks and feels special too. Go for it! To find out about ladies' corsages, click here.